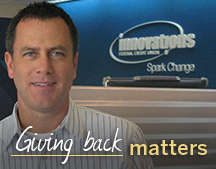 Innovations Federal Credit Union is sparking change for FSU Panama City students. The credit union recently committed $32,500 for student scholarships. Contributions scheduled over the next five years will create the $25,000 endowment for the Innovations Federal Credit Union Endowed Scholarship Fund. To give students the opportunity to take advantage of the scholarship immediately, the credit union earmarked another $7,500 for annual scholarships until the endowment is fully funded. The first recipient was named in fall 2015. The scholarship will support degree-seeking students who are enrolled in at least six credit hours at FSU Panama City. Recipients must maintain at least a 2.5 grade point average, and preference will be given to members or dependents of members of Innovations Federal Credit Union. Innovations has supported FSU Panama City for nearly a decade, giving $54,806 to the Investing in Tomorrow Scholarship Fund, the Endowment for the College of Applied Studies, the Campus Enrichment Fund and the new scholarship. The credit union donated more than $11,000 toward the Academic Center Building Fund and has sponsored the campus’s annual dinner and golf tournament. The recent commitment promotes Innovations to FSU Panama City’s Loyalty Circle, which honors those who have donated $50,000 to $99,999 to the campus. Southall, who earned a bachelor’s degree in professional communication from FSU Panama City in 1998 and was named a Notable ’Nole in 2008, said the credit union supports the campus because of its impact on the local economy. Innovations has several executive-level managers and other employees who are FSU Panama City alumni, he noted. There also are several employees working toward a degree through the credit union’s educational reimbursement policy. “It’s good for the employee, it’s good for Innovations, and it’s good for the community. Win-win-win,” Southall said. Innovations Federal Credit Union, which has evolved from a 1952 desk-drawer cashbox at the U.S. Navy Mine Countermeasures Station in Panama City Beach, serves anyone who lives, works, worships, volunteers or attends school in Bay County. It has almost 19,000 members as of January 2015 at its six locations throughout the county, according to the Innovations website. To apply for a FSU Panama City scholarship, students must complete the FAFSA and the Foundation Scholarship application. For more information on establishing an endowed scholarship, call FSU Panama City Director of Development Mary Beth Lovingood at 850-770-2108 or email mmblovingood@pc.fsu.edu.